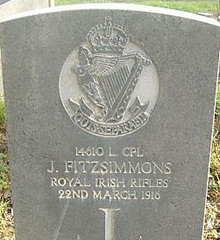 John Fitzsimmons was the son of Joseph and Matilda Fitzsimmons. John was born in Dungannon about 1871. The family moved to Belfast. His parents were retired grocers. John worked as a mechanic in a foundry. By 1911, John now worked as a ‘Commercial Traveller Engineering’. Lance Corporal Jack Fitzsimmons was serving with the Royal Irish Rifles when he was injured. 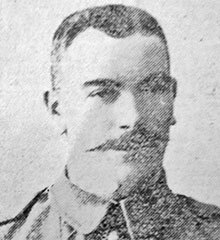 Lance Corporal Fitzsimmons died of wounds on 22 March 1916. He was 45 years old.